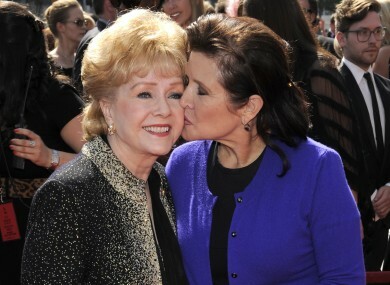 SCREEN ICON DEBBIE Reynolds and her daughter, Star Wars legend Carrie Fisher, are to be buried side by side among numerous stars of Hollywood’s Golden Age this week, according to US media reports. ABC News said a private memorial service limited to family and close friends would take place tomorrow. Reynolds’s son Todd Fisher told ABC’s 20/20 last week that he was planning a joint service at Forest Lawn Memorial Park in the Hollywood Hills with the help of Billie Lourd, his niece and Carrie Fisher’s daughter. “I’m not sure what they’re calling it – a funeral or a wake – but it will be Thursday at the house,” the source said. It will be exactly what they both wanted, to be together. Other celebrities laid to rest at Forest Lawn include Bette Davis, Reynolds’s onscreen mother in A Catered Affair (1956), and Reynolds’s close friend Liberace. Silent film star Buster Keaton, Oscar-winning Rod Steiger and David Carradine, the star of Kung Fu and Quentin Tarantino’s Kill Bill films, are also buried there. Reynolds, who tap-danced her way into American hearts as a star of Singin’ in the Rain, died on Wednesday last week, a day after daughter Carrie Fisher’s death. “She didn’t die of a broken heart. She just left to be with Carrie,” Todd Fisher told 20/20. Fisher, who catapulted to worldwide stardom as rebel warrior Princess Leia in the original Star Wars trilogy, died in Los Angeles four days after suffering a heart attack on a transatlantic flight. She was 60. “There are no words to express how much I will miss my Abadaba and my one and only Momby. Your love and support means the world to me,” the 24-year-old wrote. Email “Carrie Fisher and Debbie Reynolds will be buried together tomorrow”. Feedback on “Carrie Fisher and Debbie Reynolds will be buried together tomorrow”.